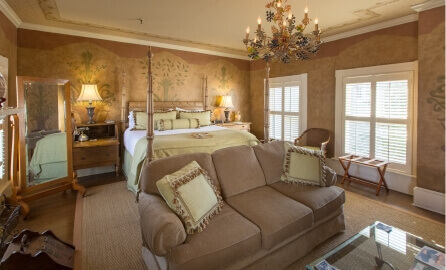 We work hard to ensure that our guests have the premier Savannah bed and breakfast experience at Ballastone Inn. 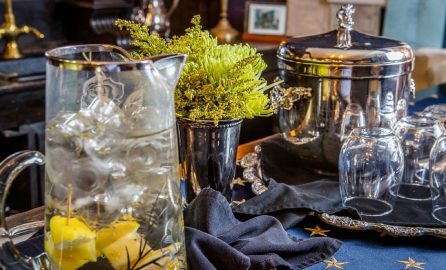 This experience is curated by the coalescence of our innkeeper's collection of antique silver and chinaware, table-for-two privacy, all-day bar with beer and fine wine for purchase, and Southern indulgences prepared daily by our in-house chef. 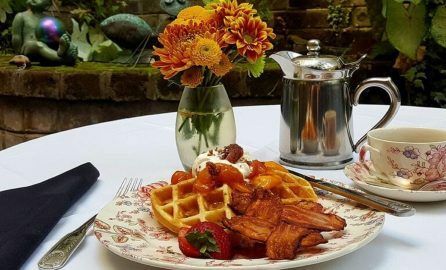 Our seasoned innkeeper, who visited bed and breakfasts nationwide before owning her own, has taken the best of her visits to create the paramount B&B experience. Join us at Ballastone for Savannah’s longest breakfast hour from 8 a.m. to 10 a.m. Take your time snacking on freshly made granola, Greek yogurt, fresh-baked bread, and fruit while our chef prepares your hot breakfast. The hot breakfast selection changes daily but includes sweet and savory delectables like rich bananas Foster waffles and fluffy egg casserole. Enjoy your breakfast in an intimate setting with our table-for-two privacy and individual table service. 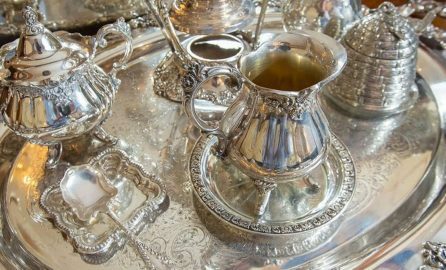 Our formal High Tea hour is held daily from 4 p.m. to 5 p.m. It’s served in the Tea Room and can be a social endeavor or a private dining experience. Whether you choose to spend this hour outdoors or inside at a table for two, you can enjoy various finger foods made in-house. Help yourself to Southern staples like pimento cheese and tomato sandwiches and tomato, bacon, and basil sandwiches. 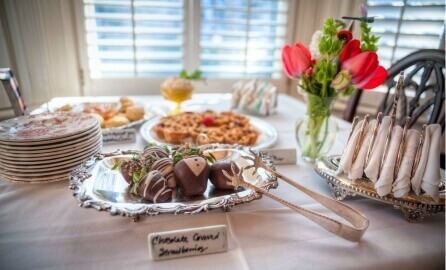 Or, indulge in miniature red velvet cakes and tart lemon bars if you have more of a sweet tooth. Afternoon social hour begins at 6 p.m. for guests to mingle before their dinner reservations. During this time, you can snack on a charcuterie plate and purchase different types of champagne, red wine, and white wine that have been personally selected by our innkeeper. All of the options are palatable to the Ballastone Standard, and our innkeeper challenges you to try to find them at your local grocer! Return to the Ballastone Inn after you’re full and happy from dining at one of our concierge’s recommendations. Finish your night with complimentary port and sherry at our bar. This quiet yet convivial bar showcases our inn’s beauty and is the perfect place to unwind before retreating to your room for the night. 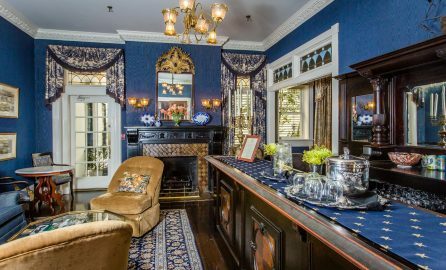 You'll feel as if you've stepped back in time when exploring our historic Savannah inn and accommodations, originally built in 1838. Fortunately, quite a few updates have been made since then! 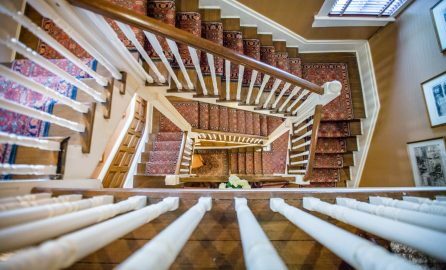 Today, guests can navigate our ornately decorated four floors with the comfort and ease of an elevator, unlike many other historic homes and inns in Downtown Savannah. 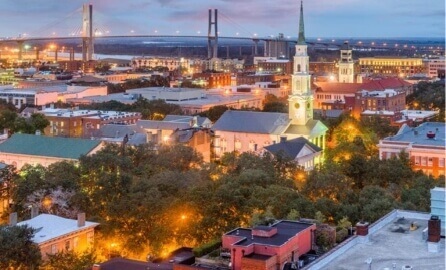 Request our Insider’s Guide for further insight into what to do, see, and eat in Savannah when you stay at Ballastone Inn.